The Statue of Liberty's welcoming figure is a symbol held dear to Americans. The famous lines from Emma Lazarus's poem: "Give me your tired, your poor/Your huddled masses yearning to breathe free… Send these, the homeless, the tempest-tost to me," speak of an unqualified welcome to the land of immigrants. For many, it has been. But not for all. The reality is that U.S. immigration policy, both throughout history and today, has often been more limiting than encompassing, and sometimes it has even been ruled by racism, prejudice, political concerns, and fear. Immigrants yearning to breathe free have found themselves denied, as when the St. Louis, a ship filled with Jewish refugees from Nazi Germany sought refuge in American ports and was turned away. Immigrants have found themselves detained, as when Japanese Americans during World War II were rounded up and placed in detention centers—regardless of their patriotism—for security reasons. And immigrants have found themselves deported, sometimes for their radical political views, as did Emma Goldman, who after 30 years in the U.S. was sent back to Russia after she was branded a dangerous extremist. Ann Bausum examines these immigrant stories from history, the stories of the denied, detained, and deported, so that we can learn from past mistakes. Shedding light on the dark side of immigration helps inform one of the most important policy debates of our time. It helps us chart a course that will keep the golden lamp of liberty burning bright. Poem foreword by Naomi Shihab Nye. The more I work with history, the more I marvel at the echoes from the past. Sometimes these echoes occur when current events repeat patterns from earlier eras. Sometimes they speak through visits to historic places. 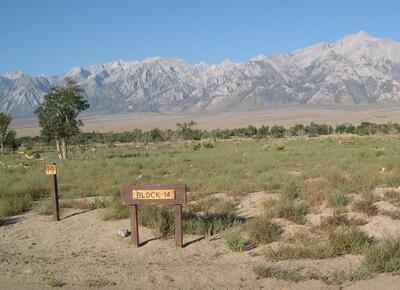 One of the places I visited while researching Denied, Detained, Deported was the site of the former Manzanar internment camp in eastern California. In preparation for writing "Detained," the book's fourth chapter, I wanted to visit one of the places where Japanese Americans were imprisoned during World War II. Welcome to history. 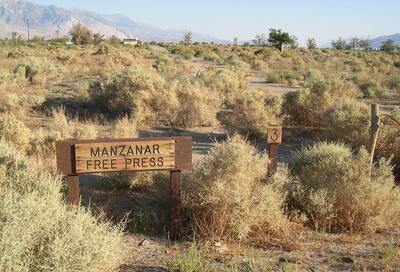 A sign marks the entry point to the Manzanar prison camp. 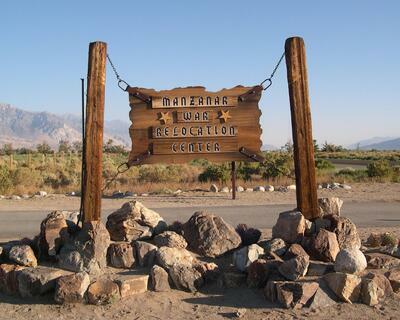 In August of 2008 I added a couple of days to a business trip in the Los Angeles area and set out to visit the Manzanar National Historic Site. This national park facility preserves the remains of one of the ten prison camps where some 120,000 Japanese Americans—most of them U.S. citizens—where incarcerated following the bombing of Pearl Harbor, Hawaii, by the Japanese government in 1941 and the subsequent U.S. entry into World War II. 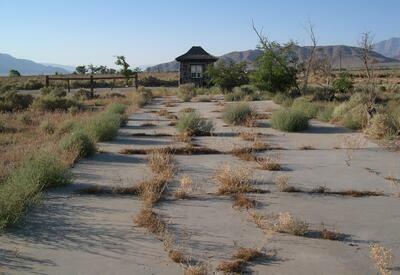 The site is located in Owens Valley, one valley west of Death Valley. Just driving to the site reinforced what I had read about these relocation centers: They were in the middle of nowhere in some of the harshest, most desolate environments imaginable. It took me hours to cross the state as I drove through blistering heat, grateful for the car's air conditioning and the supply of water I'd brought along for the trip. I visited the historic site early the next morning, and, even with the sun barely up, I found myself sweating as I walked, photographed, and explored via car the remains of the vast encampment. This replica of one of the camp's guard towers reminds visitors that residents were kept under constant surveillance at Manzana. In my chapter about the wartime treatment of Japanese Americans, I share the experiences of Mary Matsuda and her family. 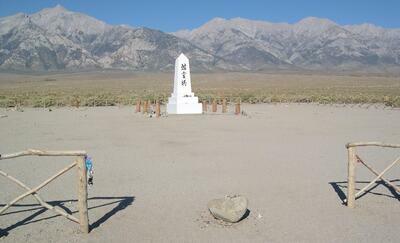 Although the Matsudas did not stay at Manzanar, their experiences took place in similar environments. Mary recorded her memories in a moving recollection called Looking Like the Enemy. For me, the visit to Manzanar added spatial dimensions to the descriptions of uncertainty, fear, boredom, and frustration that she conveys in her evocative, powerful book. Even if you can't visit Manzanar in person, you can explore historical images from the site through the Library of Congress. Noted landscape photographer Ansel Adams took hundreds of photos at the camp in 1943 on assignment for the U.S. government. A few of them are available through a collection overview posting. Hundreds more taken by Adams and other photographers may be found by entering the search term "Manzanar" in the Prints and Photographs Online Catalog.I've included a few of my snapshots from the trip in the following photo essay. They provide eerie echoes of history from an earlier age. In some cases I've even added links to comparative images taken during the camp's occupation. 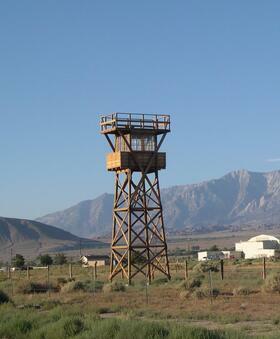 This replica of one of the camp's guard towers reminds visitors that residents were kept under constant surveillance at Manzanar. Camp buildings were sold and recycled after World War II. Foundations (and park signs) mark where they stood. 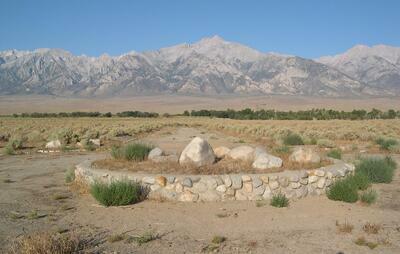 Entrance to the Manzanar cemetery: People were born in the camps, and people died there, too. This monument is one of the few original camp features to survive the test of time. Although the Japanese Americans were not permitted to bring pets with them to camp, over time they adopted new ones. 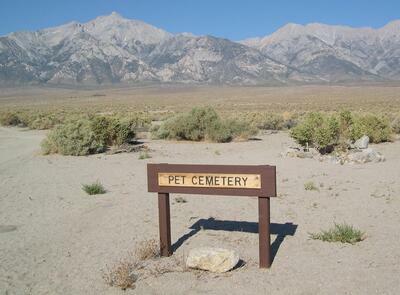 Animals had their own camp cemetery. The residents of the prison camp may have lost their freedom, but the name of their newspaper—Manzanar Free Press—referenced this American right. Ansel Adams photographed the newspaper office in 1943. Street scenes from the past can be imagined by viewing the remains of roads like this one around a traffic circle. Street scenes from the past can be imagined by viewing the remains of roads like this one leading to the camp's entrance check point. Although many stories from U.S. immigration history are heart-warming and instill pride in our tradition of welcoming newcomers to America, there is a darker side to our immigration past, too. I explored that more troubling history in Denied, Detained, Deported through a series of episodic accounts of U.S. immigration policy gone wrong. This presentation focuses in particular on one of the five incidents recounted in that book: The detention of some 120,000 Japanese-Americans (a majority of whom were U.S. citizens) as a homeland security precaution during World War II. Using archival and contemporary images I outline the nature of this massive incarceration and explore the motives behind it. I talk about my research of this history, too, including my visit to Manzanar National Historic Site, one of the prison camps from this era. 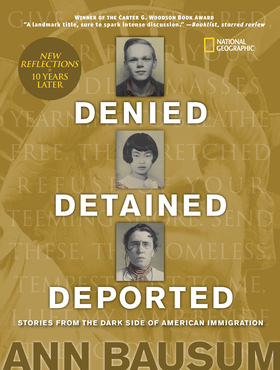 I introduce additional examples of the dark side of American immigration, too, drawing on other stories from the book—the exclusion of Chinese-Americans, the deportation of activists during the Red Scare that followed World War I, the denied entry of refugees from pre-war Nazi Germany, and the exploitation of immigrant Mexican workers. Threads emerge throughout the presentation of repeating patterns from earlier abuses that connect to the present day. "Fantastic visual aids—pictures really illustrated meanings. Very pleased with your ability to interact with the different age groups. You fielded questions very well." "With personal narratives and heartbreaking photographs, this beautifully designed photo-essay connects past immigration issues of economics, racism, national security, and patriotism with what is happening now....Individual chapters look closely at instances of immigration gone wrong....Following these moving profiles, Bausum discusses crucial contemporary problems, including the post-9/11 debate about monitoring Islamic extremists. Throughout, she is passionate about the respect due to illegal immigrants, even as she shows the unions' concern that illegals keep wages low.....A landmark title, sure to spark intense discussion." "Opening with Emma Lazarus's famous poem, 'The New Colossus,' and a powerful response poem by Naomi Shihab Nye, this volume deals frankly with the more troubling aspects of United States immigration policy. The author chose the stories of three immigrants. Each one stands alone, but read together they show a disturbing trend....Each story explores parallels in the present day. The themes of the three stories are unified by the introduction and conclusion....Photographs throughout will help students relate to the narrative....This book is not intended to cover the entire topic of immigration, but instead focuses solely on instances in which the United States appears to have made mistakes....This is an interesting and readable book, well worth purchasing for any collection." "Emma Lazarus's poem "New Colossus," followed by a new poem by Naomi Shihab Nye...open this compelling look at ways the United States has sometimes rejected, ejected, and exploited individuals wanting to make a home here....Each [chapter] builds on those that come before....The design of [photos] presented is striking....This eye-opening volume offers a critical perspective on policies and attitudes of our nation." Online exhibit about the "Voyage of the St. Louis"
Dear Miss Breed, by Joanne Oppenheim, Scholastic, 2006. Looking Like the Enemy, by Mary Matsuda Gruenewald, NewSage Press, young readers edition, 2011. Refuge Denied: The St. Louis Passengers and the Holocaust, by Sarah A. Ogilvie and Scott Miller, The University of Wisconsin Press, 2006. What could have been a chapter in Denied, Detained, Deported became its own book. Explore the treatment of German-Americans during World War I during this accounting of the era's battle for democracy on the home front.